Sylvia joined the Tempe Arizona Police Department as the Chief in March 2016. A California native, Chief Moir has nearly 30 years of local police practice. She was the Chief of the El Cerrito Police Department from 2010 until her appointment as the Police Chief in Tempe, Arizona. Chief Moir spent most of her early career with the Sacramento Police Department where she served in every division of the department. She was the Incident Commander on hundreds of planned and spontaneous events, a trainer in several policing subjects, and a member of the Sacramento Police Honor Guard. She completed rigorous training with the US Army Old Guard at Fort Myer, VA and Arlington National Cemetery. California Governor Jerry Brown appointed Chief Moir to the Commission on California Peace Officer Standards and Training for two terms, and she served on the Executive Committee for the California Police Chiefs Association. She is currently an Executive Fellow for the Police Foundation, on the Community Policing Committee of the International Association of Chiefs of Police, an advisor for the American Law Institute, a member of the Law Enforcement Immigration Task Force, and on the Law Enforcement Council for the U.S. Humane Society. Chief Moir holds a Bachelor of Science in Criminal Justice from California State University, Sacramento, a Master of Arts in Organizational Management, and a Master of Science degree from the Naval Postgraduate School - Center for Homeland Defense and Security. She is married, lives in Tempe, and enjoys reading, hiking, competing in marathons, and passionately cheering on the Boston Red Sox and the Chicago Bears. 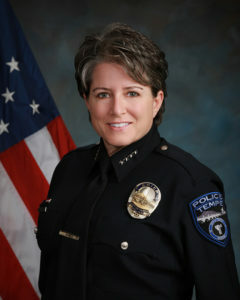 Sylvia is currently serving as the Fifth Vice President for the Arizona Chiefs of Police Association.